Deploy OPC DA Server for Oracle and have an OPC interface for Oracle! Integration Objects’ OPC DA Server for Oracle is a plug and play OPC Server. It enables OPC DA clients to interface with any Oracle database connected to your network. 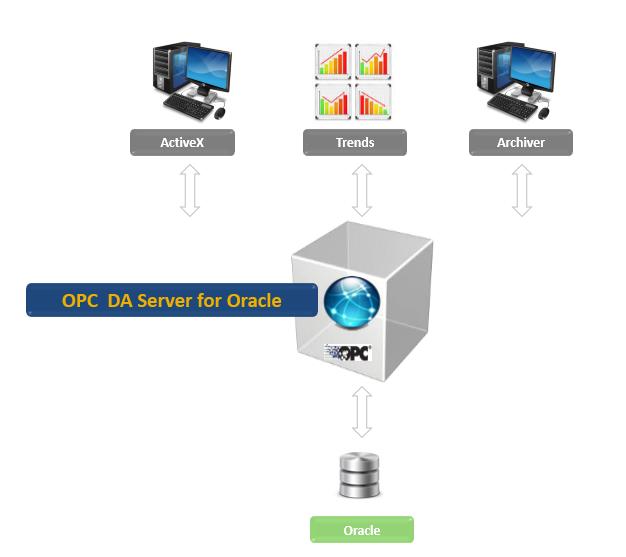 The OPC DA Server for Oracle reads data from Oracle databases using the Active Data Objects (ADO) technology. It can also update the data records using the same link. With a few clicks, you can access and share data stored in your Oracle database for analysis and troubleshooting purposes. You can also use this standard OPC DA interface to synchronize data between your Oracle database and other historians, SCADA, or DCS available in your organization. By adhering to industry standards such as OPC and ADO, this server allows you to build open architectures and ensure interoperability between your systems. OPC DA Server for Oracle is a feature component of the OPC Driver for Databases.